Our PROFESSIONAL model Integral Suppressor Conversion on the Ruger® MkII/MkIII/MkIV ™ is available in several configurations. 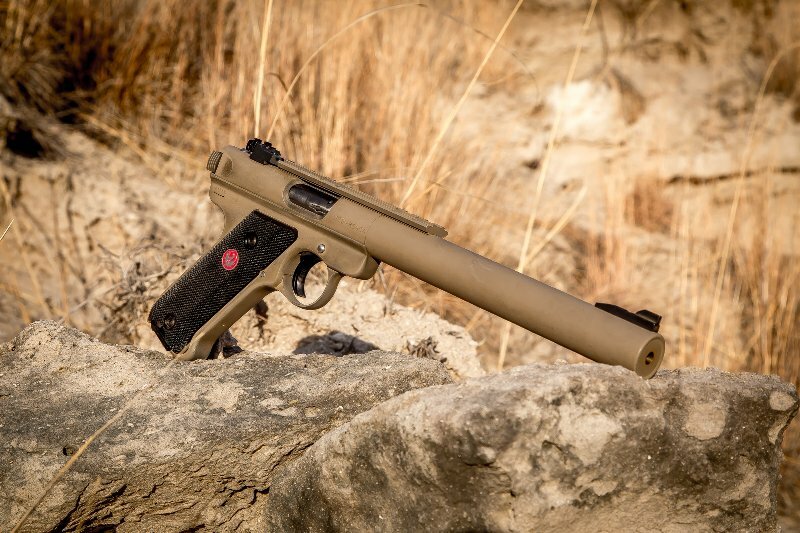 You have a choice of either stainless steel, or Cerakote finish on blued pistols, and with suppressor tube lengths of 7.1″ (standard) and 7.8″ ,as measured from the front of the receiver. At this time, the customer must supply the host Ruger® MkIV, MkIII, MkII™, or MkI for us to integrally suppress. The Professional model, designed for civilian use, will cycle most ammo including many subsonic. Bullet velocities on all Professional models are the same regardless of tube length, and are the highest in the industry, and of course, these guns will cycle most all ammo flawlessly, including many subsonic, so you can dial in your sound level/bullet velocities to match your requirements. The PRO model runs Remington bulk pack high velocity ammo at around 116 db, Remington subsonic is about 112 db. The Government model *Mk3, Mod. 0* Integral conversion Ruger® MkIII™, was designed for the US military specifically for use with 40 gr CCI MiniMags, and extends beyond the grip frame only 6.8″, has an SPL of 114 db with CCI #0030 40 Gr MiniMag ammo, and is Cerakoted in a Desert Tan finish. It will NOT cycle subsonics. 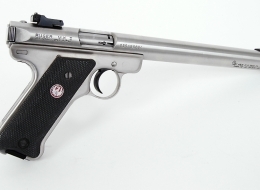 We will only build this on a stainless 5.5″ bull barrel Ruger® MkIII™, Ruger(® model #10103, we will not do this conversion on any MkII™, or other Ruger® MkIII™. 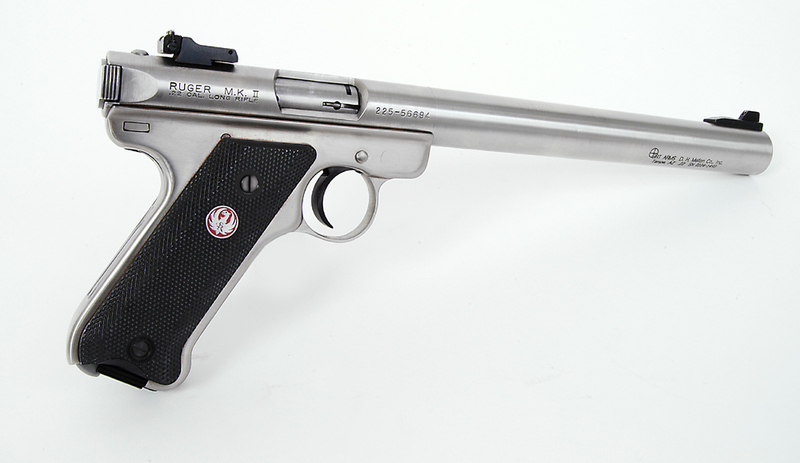 The Government model Integral conversion Ruger® MkIV™, is functionally equivalent to the Govt Model Mk3, Mod.0, but DOES NOT carry the Mk3, Mod.0 designation, and simply says “Govt” on it, and is built on a Ruger® Mk IV™ stainless 5.5″ target bull barrel you you will supply to us. 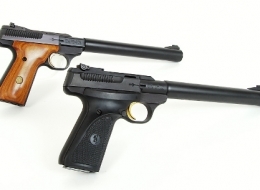 Both model guns are designed for the serious shooter, who is concerned about accuracy, reliability and bullet velocity. This gun, like all of our .22 pistols, allows the suppressor tube to be removed from the gun to let you clean the expansion chamber surrounding the barrel. A .22 is dirty, and after a few thousand rounds, if you can’t scrape the crud out the expansion chamber, it will clog, and the gun starts getting loud. Baffles are fixed, and not removable by the user due to their complexity. We can service the suppressor if it becomes necessary. 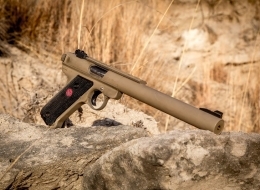 The advantage of the Ruger® MkII/MkIII(TM) as a suppressed firearm is it’s stealthy appearance; to the uninitiated, it looks just like a heavy bull barreled gun, and is several dB quieter than the best muzzle suppressor. We do NOT recommend Federal of Aguilla SSS ammo in integral guns. The Buckmark is available in several configurations. You have a choice of either stainless steel tube on a nickel plated or stainless gun (Buckmark only), or matte black Cerakote finish tube/barrel on a black gun, and with suppressor tube length, and 7.1″, as measured from the front of the receiver. The standard suppressor tube length on the Buckmark is 7.1″ long. 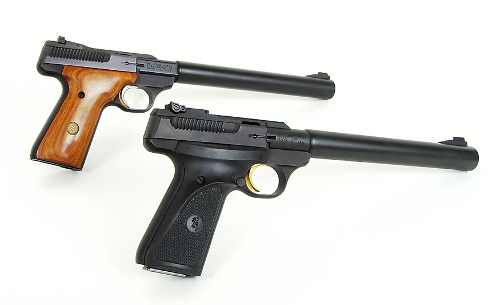 Since the Buckmark barrel is longer than the Ruger® MkIII™ barrel, when modified for the suppressor, the 7.1″ is equal to the 7.7″ tube on the Ruger®. * Buckmark muzzle db is the same as the Ruger® conversion Professional model. Bullet velocities on all guns are the same regardless of tube length, and are the highest in the industry, and of course, these guns will cycle all ammo flawlessly, including subsonic, so you can dial in your sound level/bullet velocities to match your requirements. These guns are designed for the serious shooter, who is concerned about accuracy, reliability and bullet velocity. This gun, like all of our .22 pistols, allows the suppressor tube to be removed from the gun to let you clean the expansion chamber surrounding the barrel. (A .22 is very dirty, and after a few thousand rounds, if you can’t scrape the crud out the expansion chamber, it will clog, and the gun starts getting loud). The Browning is a very nice firearm to suppress, and is a perfect companion to the hiker or woodsman . 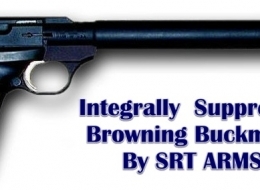 It is a high quality firearm, and with it’s action that is open on both sides, it requires less frequent cleaning than the Ruger(®, as blowback crud can more easily escape. The ease of barrel changes means that you have the option of merely buying a suppressed barrel for your Browning, and changing suppressed/unsuppressed barrels as you see fit. * Additional tube length does not make the Buckmark quieter, and only adds back pressure, resulting in more ejection port noise.